UNIQUELY EQUIPPED, LEGENDARY SMOOTH: Rolling on massive 28” Outlaw 2 tires, take on the dirty depths with undeniable comfort. Mud-specific arched A-arms deliver an incredible 13.5” of ground clearance and an industry-leading 11” of suspension travel to ensure you get up, over, or through the harshest terrain with legendary RANGER smoothness. 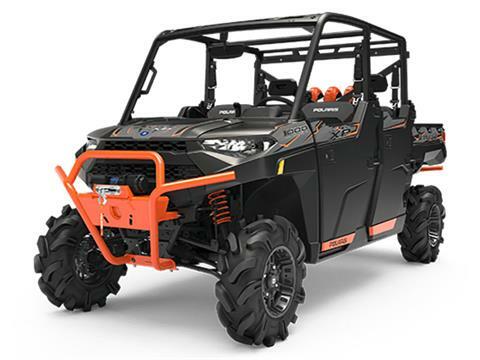 SHOW & SHINE: Rider-inspired graphics and factory-installed accessories make RANGER XP 1000 High Lifter Edition the ultimate utility mud machine, earning its High Lifter name. This tricked out new look can't be ignored at the mud bogs. COMFORT REDEFINED: The All-New interior design touts ultimate comfort with thicker seats and greater leg room, intuitive driver-centric controls, and abundant, convenient storage through the cab. THE NEW STANDARD FOR MUD: Higher-mounted air intakes to ensure clean air reaches the engine and clutches run cool. Plus, all vent lines are integrated into the cab frame to keep them free of debris. NEVER LOSE SITE: Equipped with a standard rear view mirror so you can see the entire crew with every turn. INFORMATION AT A GLANCE: The All-New combination digital/analog gauge packed with instantly accessible features and easy to view even in direct sunlight.